Bees are essential to our food supply and health, but they are profoundly threatened by environmental changes and disease. Matthew will discuss honeybees and native bees, helping us to understand their differences, functions and life patterns. He will discuss how we can assist bees in our gardens. The past week has been a tough one for this gardener. First, I disturbed a hidden fire ant mound and received multiple stings on both ankles. Two days later, while weeding near my mailbox I came too close to a new wasp nest and was stung through my garden glove. Fortunately, I have a well-stocked first aid kit handy and was able to treat the stings and return to the garden. Are you prepared for bites and stings that may happen when you’re outside? Mosquitoes, ticks and chiggers bite in order to feed. While their bites can cause itching and may carry disease causing organisms, these insects are not venomous. To avoid bites from these insects, use repellent and wear clothing that covers the skin. Remove ticks promptly. Itchy bites can be treated with an anti-itch cream. Seek medical attention if you have symptoms of a mosquito or tick borne illness (such as headaches, fever, nausea, and muscle aches). Bees, wasps, and fire ants sting as a defense, injecting venom with each sting. While bees can only sting once, wasps, yellow jacket, hornets, and fire ants are capable of multiple stings. Stingers are modified egg-laying structures, so only females are capable of stinging. Fire ants swarm when their mound is disturbed. Many ants may climb onto a person, attach to the skin with their mandibles, and will begin stinging within 10 seconds. Fire ant venom causes a burning sensation. After several hours, white pustules develop at the site of the stings. If you are stung, quickly move away from the area and brush all ants from your body. Carefully wash the area and apply cold compresses. To reduce the chance of infection, avoid breaking the pustules open. Pain can be treated with over the counter analgesics, and itching with an anti itch cream. The best defense for fire ant stings is avoidance. Wear protective clothing and avoid visible mounds. Be alert for foraging ants when weeding gardens or walking in tall grass. Bees, wasps, and other related insects are not deterred by insect repellents, so avoidance is the best protection from stings. Protective, light colored clothing is also recommended. Avoid wearing perfumes or using highly scented soaps when working outside. Do not swat at bees or wasps. Picnic areas and garbage cans can attract some kinds of stinging insects, while others are fond of flowering plants. Be cautious and observant when near areas that wasps and bees may find attractive. Wasps, in particular, can be aggressive in guarding their nests, particularly in late summer and fall. Bee and wasp stings can be very painful. Other symptoms include redness, swelling, and itching. If you are stung, try to remove the stinger by scraping, NOT squeezing, the area. Squeezing or using tweezers could cause more venom to be released. Ice the area or use cold compresses to reduce swelling. A topical analgesic or anti itch cream can be used if necessary. Oral analgesics or antihistamines can be taken if necessary. Be prepared, be observant, but don’t let the fear of insect bites keep you from enjoying the outdoors! Bumble bees are easily recognized by their shape and their fuzzy yellow and black bodies. Like honey bees, bumble bees are social insects that form colonies with a queen and workers, although their colonies are not as long lasting as honey bees and are usually much smaller. Bumble bees nest in the ground, often using old rodent holes or other cavities, as well as in tufts of grass. A small amount of nectar is stored as a food source, but only enough to feed the queen and members of the colony. In spring, the queen chooses a nest, forages for pollen, then lays her first batch of eggs. These will become workers, and are all female. Once these workers have pupated, they take over the job of collecting nectar and pollen, and the queen remains in the nest to lay more eggs. Workers will defend the nest when disturbed and do not lose their stingers when they sting. Both males and females are produced in broods that hatch in summer. Males generally leave the nest attempting to find mates. New queens mate, feed, then overwinter. Most of the rest of the colony, including the old queen, dies out by winter. Bumble bees can use a technique called “Buzz Pollination”, in which the bees use flight muscles to shake self fertile flowers (flowers that have both male and female structures). Tomatoes and blueberries are two crops benefit from buzz pollination. In fact, bumble bee colonies are sometimes farmed to aid in pollination of tomatoes in greenhouses. Bumble bees frequently have longer tongues than honey bees, so they can sip nectar from flowers with a longer shape. This makes them important pollinators for wild flowers that are food sources for birds and wildlife. Shorter tongued bumble bee species will sometimes cut a hole in a flower to feed on nectar without pollinating the flower. Many bumble bees will forage in lower light, in cooler temperatures, or even in rain; conditions that aren’t favored by honey bees. If you have a wooden fence or porch railing, carpenter bees might not be on your list of favorite insects, but they are important native pollinators. These bees do not live in colonies like bumble bees or honey bees and do not have a social system with a queen and workers. Males are territorial and seem aggressive to anyone nearby, but they do not have stingers. While females do have stingers, they rarely sting unless provoked. Carpenter bees tunnel into wood to build nests, which may extend six or more inches along the grain of the wood. Nest sites are generally in dead but not decayed wood, but these bees will also build nests in fences, porches, and other wooden structures around our homes. Females lay eggs in spring and seal the eggs in chambers using a substance made from chewed wood and saliva. The larvae feed on pollen balls left in their chambers, pupate, and emerge as adults in late summer. Adults overwinter in cleaned-out tunnels and can live up to three years..
Carpenter bees look similar to bumble bees, but instead of being fuzzy all over, carpenter bees’ abdomens are shiny and black. Like bumble bees, Carpenter bees visit a wide range of flowers and use buzz pollination to shake pollen grains from flowers’ anthers. If you love tomatoes, peppers, and eggplant, you may want to overlook the occasional hole in your fence because of their skill at pollinating these plants. Because of their large size, carpenter bees don’t fit inside some tubular flowers and may rob them of nectar by cutting a slit at the base of the flower in the same manner as the shorter tongued bumble bees. Carpenter bees eat nectar and pollen, but do not feed on wood. 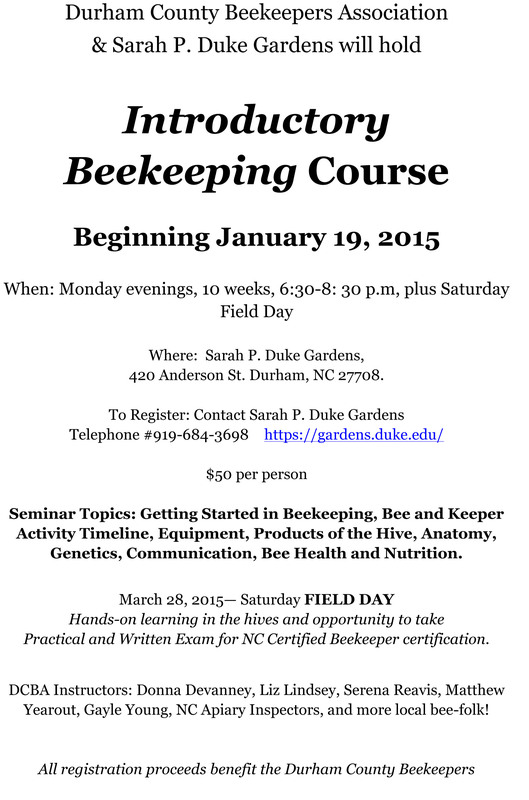 A membership to DCBA and a copy of First Lessons in Beekeeping are included in the course fee.